Home / adult swim / animation / cartoon network / Television / The Venture Bros / toonami / GO TEAM VENTURE! After a more than two year wait, The Venture Bros are go again. 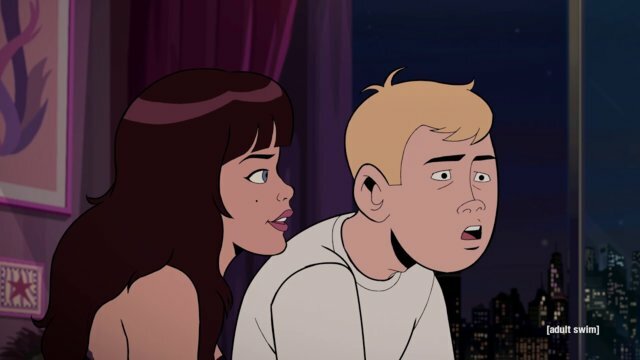 "The Venture Bros and the Curse of the Haunted Problem" pretty much picks up with the Venture family living in the same New York City building owned by Rusty's deceased brother Jonas, Jr. Dean is still skittish, Brock is very much the tough guy bodyguard, Hank is still delivering pizza and Rusty is... Rusty. This is good because I have a feeling that this next season of Venture Bros. is going to raise the stakes, at least in terms of the comic book related adventures. The previous seasons, excluding maybe the last one, were a pastiche of many things including the funny papers stuff but this one seems to go all in on that count. It begins with a flashback to an adventure with Jonas, Jr. This gives us the setup to the rest of the episode's plot involving a piece of Jonas, Sr.'s ship, the Gargantua-1 and a potential haunting of the computer systems in the Venture building. Haunting and computers means the Order of the Triad is coming to the scene along with the forever fancy Pete White and his technological humor ("Yeah, Acid Burn and Zero Cool helped me bypass the encryption."). And where you have Pete, then Billy Quizboy, his mother and the original Team Venture isn't far behind. It's a good thing too because the things that Jonas, Jr. has found in the Gargantua-1 wreckage are causing a "problem." All this is fun but I'm really looking forward to the potential awesomeness of Hank Venture this season. Hank is always on his weird side quests and this seems to be no different in 2018. His romance of the leader of the daughter of East Coast crime boss Wide Wale, Sirena Ong, continues. This episode brings it all to a head, costing Hank his job at Vincenzo's pizza, getting him banned from Wale's building and Wale's thugs vandalizing his vehicle. This pushes Hank to the edge and he goes to Sgt. Hatred for advice, which is not always the best decision, but it does bring back one of my favorite characters in this series. 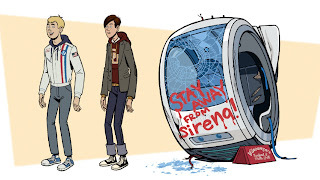 It also positions Hank in a very engaging story going forward which I hope they develop. I also hope Sirena is around for a long time because she is fun and very New York. (That's a compliment as a guy from New York can attest) She also works well with her brashness complementing Hank's naivete. All in all, I'm looking forward to the upcoming season. This first episode is essentially the first in a two-parter that continues next week. The second episode seems to concern the activities of the villains in the Venture universe and how they will deal with the new Blue Morpho aka the Monarch, which will be interesting with how this premiere episode ended. I'm ready for the geeky action. Tune in for this season and GO TEAM VENTURE!